Department of Medical Microbiology School of Medical Laboratory Sciences AhmaduBello University Teaching Hospital, Zaria. Department of Microbiology, Faculty of Life Sciences, Ahmadu Bello Univesity, Zaria. Department of Medical Microbiology, Ahmadu Bello University Teaching Hospital, Zaria. Background: Bacterial infections that are difficult or impossible to treat are becoming increasingly common and are causing a global health crises due to antibiotic resistance ,while reports have indicated that pneumococcal infection is an important public health concern throughout the world with global burden in causing disease and death comparable to that of Human immunodeficiency virus(HIV), Malaria and Tuberculosis(TB). The Penicillin and Macrolides belong to the groups of most commonly used, clinically important antibiotics for treatments of infections caused by Gram-positive bacteria such as S.aureus, S.pneumoniae and S. pyogenes.Some bacterial pathogens have innate resistance against antibiotics and this typically reflects variations in the structure of their cell envelope.Polysaccharide capsule of Streptococcus pneumoniae defines over ninety serotypes, which differ in their carriage prevalence and invasiveness for poorly understood reasons. They also showed there is a link between serotype and growth in-vitro.This study was carried out to determine pneumococcal serotypes and resistance to selected antibiotics among patients with symptoms of respiratory tract infections (RTIs) attending Acute-care health facilities in Kaduna state, Nigeria. Methods: Sputa was collected from patients with suspected cases of RTIs. Culture and sensitivity was conducted, and pneumococci were serotyped. Results: A total of 450 Subjects were enrolled for the study. 207(46.0%) yielded pathogens of which 41(9.1%) were Streptococcus pneumoniae.Pneumococcal isolates were commonly resistant to Cefuroxime 76.2%, Ampicillin 64.4%, erythromycin 45.2 % and Azithromycin 40.5%. Four different pneumococcal serotypes were detected in the study area. Conclusion: This study shows that the pattern of pneumococcal resistance against Penicillin and Erythromycin discourages the common practice of doing sensitivity on one antibiotic and another is used for treatment due to availability or cost implication. The Pneumococcal isolates have shown resistance not only to penicillin and erythromycin but also to alternative antibiotics like Azithromycin, cefuroxime and ceftriaxone. The most common serotypes were 3 and 13. Key words: Resistance, Sensitivity, Minimum inhibitory concentration (MIC), E-test, serotype Acute-Care Health care facility, Erythromycin, Penicillin, Antibiotics, Pneumococci, RTI, HIV, and TB. Streptococcus pneumoniae is the most common cause of bacterialacute respiratory infections(ARI)and Pneumococcal resistance is the principal cause of concern regarding treatment failures for ARI (Schrang et al.,2001).Pneumococcus is also the most common cause of community acquired pneumonia (CAP), sporadic bacterial meningitis and bacteremia worldwide. In 2005, WHO estimated that 1.6 million people die of pneumococcal disease every year(Bandettini and Melioli,2012). Nigeria is currently one of the highest pneumococcal disease burdened countries and accounts for 5% of the global burden (Iwalokun et al., 2012; Iliyasu et al., 2014).Thoseexposed to or residing in risk areas such as Acute-care health facilities are at higher risk for invasive pneumococcal disease and death than those residing in communities (Kusteret al.,2014).An association has been established between the type of polysaccharide capsule surrounding the bacteria and harmless colonization versus invasive disease.Antibiotic resistant bacteria that are difficult or impossible to treat are becoming increasingly common and are causing a global health crisis (Abla et al., 2014).Drug resistant infections could kill an extra10 million people across the world every year,if by 2050 they are not tackled they could cost the world around $100 trillion in cost output (AMR Review, 2014).Drug resistance trends are not well documented in most developing countries due to limited laboratory capacity and acute respiratory infections (ARI) are often treated empirically with antibiotics (Schrang et al., 2001). The global emergence of in-vitro antimicrobial resistance and dissemination of penicillin and macrolide resistant Streptococcus pneumoniae strains has become a serious clinical concernworld wide (Mohammad et al., 2012; Alba et al., 2014). Pneumococcal infection is an important public health concern throughout the world with global burden in causing disease and death comparable to that of Human immune-deficiency virus (HIV), Malaria and Tuberculosis (TB) (Iwalokun et al., 2012).Ninety-three capsular serotypes have been identified in Streptococcus pneumoniae, each differing in chemical structure and immunogenicity (Calix and Nahm, 2010). Study Area: Kaduna state is located at the Centre of Northern Nigeria, in the Northwest geopolitical zone. The state lies between latitude 90 and 1400 N of the equator with a time of 1 hour ahead of the GMT. The state shares boundaries with Niger state to the west, Zamfara, Katsina and Kano states to the North, Bauchi and Plateau to the east and FCT Abuja and Nasarawa state to the south. It has a population of 6.63 million based on the 2006 census projections. The state is divided into three senatorial zones: Northern, Central, and Southern zones.Kaduna state has 739 Primary health facilities, 29 secondary care facilities and five tertiary hospitals (Abubakar et al., 2013).Kaduna state is administratively divided into 23 local government areas (LGAs) with several districts and wards in each LGA. Ethical Consideration and Confidentiality Ethical approval was obtained from the Ethical committees of Kaduna State Ministry ofHealth and the targeted facility.Confidentiality was maintained throughout the test analysis. Sample Collection Sputum samples from 450 patients with suspected cases of RTIs were collected in wide mouth leak-proof containers.Samples were then transported to the laboratory as soon as possible. ( CDC; Tests online, 2014).Patients consent was also sort before recruiting them for the study. Purulent part of the sputum samples were inoculated on plates of 5% Blood agar and incubated immediately in presence of 5% CO2 overnight at 37oC(Mohammed, 2013;Iliyasu et al.,2015). Bacterial isolates were identified based on morphological characters, Gram reaction, catalase test, bile solubility, susceptibility to Optochin and hemolysis (Iliyasu et al., 2015).Suspected S.pneumoniae colonies were translucent or mucoid, with raised or having draughtsman appearance and 1-2mm in diameter showing alpha-hemolysis.Microscopic examination was carried out on suspected pneumococcal colonies. The smear was Gram stained. All slides were examined under the oil immersion lens. S.pneumoniaeappear gram-positive, elongated (lanceolate) diplococcus, or forms short chains (Bacteriology-test, 2014). Appearance of gas bubble will indicated positive catalase test (Bacteriology-test, 2014).Evidence of clearing of turbidity in the tube marked test compared with the saline control was considered positive while suspension remaining turbid in both tubes was considered negative solubility to bile (WHO/CDC, 2003). A chemical-impregnated disk containing Optochin was aseptically placed in the center of an inoculated Mueller- Hinton agar surface. The inoculated plate was incubated at 37?C for 24 hours Growth of the lawn up to the margin of the disk indicates the bacterium is resistant to ethylhydrocupreine hydrochloride (optochin). An obvious clear zone around the disk (=14mm in diameter) indicates susceptibility (WHO/CDC, 2003).The susceptibility of S. pneumoniae was determined by the disk diffusion (oxoid, Thermo Fisher, Scientific, Australia) following CLSI guidelines (Wayne, 2006). Breaking points for non-susceptibility and resistance was used to indicate susceptibility of the pneumococci to the antibiotics including:Ampicillin (10µg), erythromycin (15µg), penicillin (10U), Cefuroxime (10µg), Azithromycin (10µg), Ceftriaxone (10µg), Chloramphenicol (30µg) and Tetracycline (30µg).MICs of strains displaying resistance to erythromycin and penicillin from the disk diffusion method were determined by E-test methodology (LiofilChem Diagnostics, Italy). The E-test strips were: Erythromycin (0.016-256µg/mL) and Penicillin G (0.016-256µg/mL). Resistance against the antibiotics wereinterpreted according to MIC test Strip Technical Sheet Streptococcus pneumoniae (MIC Interpretation Guide, 2015). E- Strips(Liofilchem) were applied to an inoculated Mueller-Hinton agar plate E- test and incubated at 37?C for 24 hrs in the presence of 5% CO2. Readings on the scale were considered as the MIC (in µg/mL). Serotyping (PCR Strategy)was carried out. Genomic DNA was extracted from pneumococcal cells of a fresh overnight culture.Amplicons from PCR were analyzed with 1.5% agarose gel electrophoresis (Marcus et al., 2012).The amplicons with expected cps band sizes were purified using the PCR purification kit (Qiagen) according to the manufacturer’s instructions.Sequences were analyzed and viewed with Bionumerics soft ware version5 (Marcus et al.,2012).The amplicon nucleotide sequences were used to interrogate the GenBank data base,and if the highest BLAST bit score gave the serotype.Identification was then considered as a ”match”. Where the query results did not correlate or were not consistent with conventional serotyping methods, the strain/serotype was considered as ”misidentified” (Marcus et al., 2012). Statistical Analysis The data collected were analyzed using tables and Chi-square tests .Results were considered as significant if the ?2 p-value was ? 0.05 and non-significant if p-value was > 0.05.All statistical analysis were done using IBM/SPSS Software (v20.0). A total of 450 sputum samples were cultured and isolates included: Streptococcus viridians ‘Group (SVG) 56(27.1%), Staphylococcus aureus 52(25.1%), Streptococcus pneumoniae 41(19.8%), Klebsiella pneumoniae 30(14.5%), Streptococcus pyogenes 20(9.7%), Haemophilus influenzae 5(2.4%), Enterobacter aerogenes 2(1.0%) and Moraxella catarrhalis 1(0.5%).Statistical analysis showed a significant association (P?0.05) with respect to frequency of isolates and geographical distribution as in table 1. 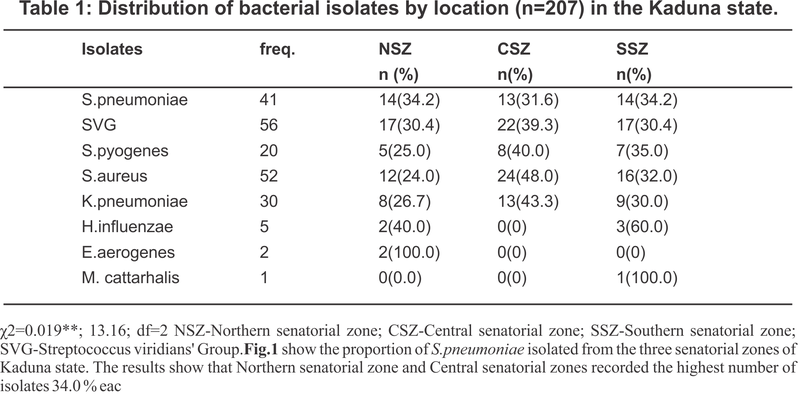 Enterobacter aerogenes 2(1.0%) and Moraxella catarrhalis 1(0.5%).Statistical analysis showed a significant association (P?0.05) with respect to frequency of isolates and geographical distribution as in table 1. Streptococcus pneumoniae is both an aggressive pathogen and a normal part of the human microbiome (Blaschke, 2016).Viridian’s Streptococci bacteria are generally disregarded as the etiologic agent of pneumonia even when isolated from cultures of sterile material.This study show that viridians streptococci should not be ruled out as a cause of pneumonia as reported by Freitas et al. (2006).The high pneumococcal prevalence in this study was likely due to predisposing factors such as; Prior exposure to risk areas such as health care settings and immuno compromised patients or patients with other medical comorbidities (Kusteret al.,2014). Penicillin has been the drug of choice worldwide for the treatment of pneumococcal infections. However penicillin resistant strains have emerged resulting in a shift to the use of other drugs e.g. 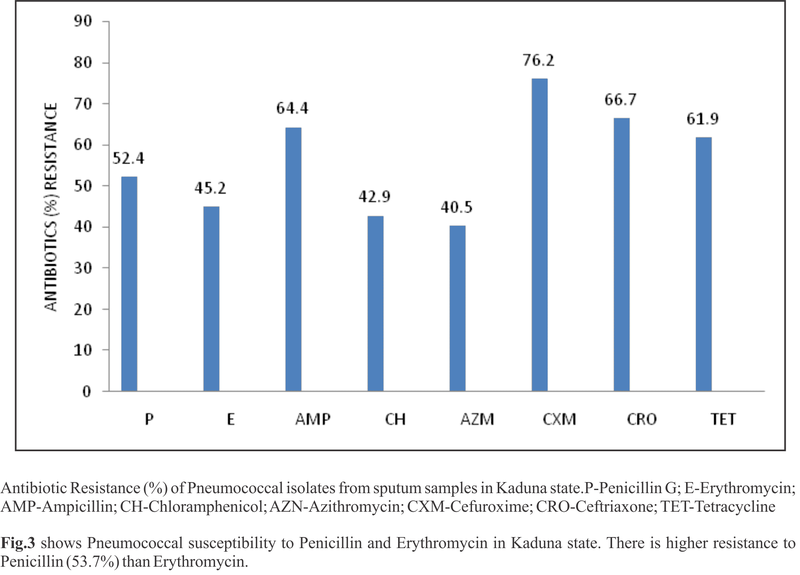 cefotaxime, chloramphenicol and erythromycin (Dankor et al., 2010).The Pneumococcal isolates have shown resistance to penicillin, erythromycin and other alternative antibiotics as reported byIliyasu in a study carried out in Kano (Iliyasuet al.,2014).Investigations from some parts of Nigeria and other countries have shown high prevalence of resistance to Penicillin and other agents. 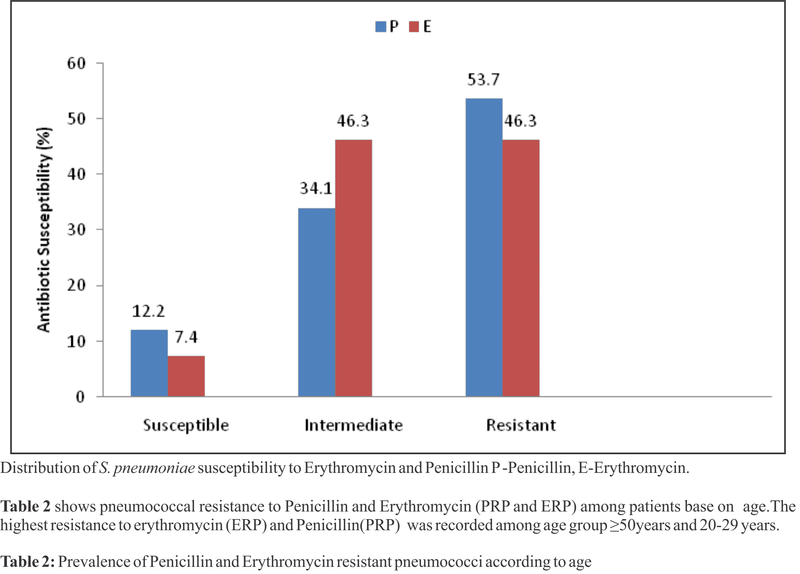 Penicillin resistant pneumococci (PRP) and Erythromycin resistant pneumococci (ERP) had prevalence of 53.7% and 46.7% respectively, in this study .The prevalence of PRP closely agrees with findings by Akpede et al. (1994) but way below findings’ by Habib et al. (2003), and Kadankai et al. (2009) who recorded prevalence of 85.4% and 93.0% respectively, however rates in this work were higher than that reported by some researchers (Emele, 2000; Oduyebo et al., 2006; Abla et al., 2014) likely due to repeated course of therapy with ß-lactams or macrolide antibiotics (Jorget al.,2016).Erythromycin and other macrolides used in this study as alternatives to ß-lactams for treatment of Respiratory tract infections(RTI) had high resistance rates as compared to works of other researchers (Abla et al., 2014; David et al., 2015), but lower than that recorded by Mohammad et al.,2012. Erythromycin resistance in some Countries were found to be higher than those recorded in this study (Song et al., 2004; Reinert, 2005; Carmargos, 2006; Jenkings, 2008).This difference might be related to the shift in use of other antibiotics in these areas as reported by Dankor et al.(2010). Higherprevalence of Penicillin resistant pneumococci (PRP) and Erythromycin resistant pneumococci (ERP) was obtained among the elderly of age (40-60) years which is in agreement with findings by Nicholas et al. (2013), the reason probably, they are immunocompromised. Year group 20-29 had higher prevalence for penicillin resistance, which is similar to findings by Mohammed, (2013) probably due to nature of exposure to more predisposing factors such as drug abuse, HIV and TB that could lower the immunity. This finding agrees with that reported by Nicholas et al. (2013) in a study carried out in Ghana. Pneumococci are normally exquisitely sensitive to penicillin, which is lethal at concentrations <0.1 µg/mL. In this study high-level (MIC =2µg/ml) PRP and ERP has been associated with bacterial pneumonia which is similar to findings by Mellay et al., (2003);Fukushima et al.,(2008) and Abla et al.,(2014).WHO in 2007 recommended the use of pneumococcal conjugate vaccines (PCV) in all countries, urging that the highest priority for introduction be given to countries with high pneumonia and under-5 mortality.Nigeria only joined other African countries to launch pneumococcal conjugate vaccine (PCV10) as part of its Routine immunization schedule on 22nd December, 2014(WHO, 2015).Accurate serotyping is essential for epidemiologic study of S.pneumoniae [CDC, (nd).The serotypes Sequenced and identified in this study were serotypes 3, 13, 20 and 23. Serotype 3 is included in the 10-valent Pneumococcal Conjugate Vaccine (PCV), the 23F serotype is included in the heptavalent conjugate vaccine. The finding is not in complete agreement with findings of Onyemelukwe and Greenwood,1998 who identified serotypes 1,2 3, and 5 in Zaria and Abla et al., 2013 in Algeria, probably because their subjects comprises both children and adults. Serotypes 13 and 20 are non-vaccine types. Serotypes 3 and 23 are also among the dominant serotypes as reported by WHO, 2007 .The findings are also comparable to that obtained by Tarrago et al., 2008; Dankor et al., 2014 but completely differs from that reported by Falade et al., 2009. The highest pneumococcal resistance to penicillin and erythromycin was obtained among patients’ =50 years of age. A prevalence rate of 23.0% pneumococcal infection was established in this study.The study shows that the isolates did not only show resistance to penicillin but also to other alternative antibiotics such as Erythromycin, Azithromycin, Tetracycline, and cefuroxime and should be used carefully in the future. The indiscriminate use of antibiotics at the community level might be probable cause of resistance obtained in this work. The use of penicillin as the best choice for treatment of infections with S. pneumoniae may need reconsideration because of the emerging trends in the antibiotic resistance. It is also pertinent to note that the resistance pattern shown by Penicillin and Erythromycin discourages a common practice in some of our Health care institutions where sensitivity is done on one antibiotic and another is used for treatment due to availability or cost implication. The implication of this study is a high potential for treatment failure with most antibacterial drugs recommended to empirically treat lower respiratory tract infections. 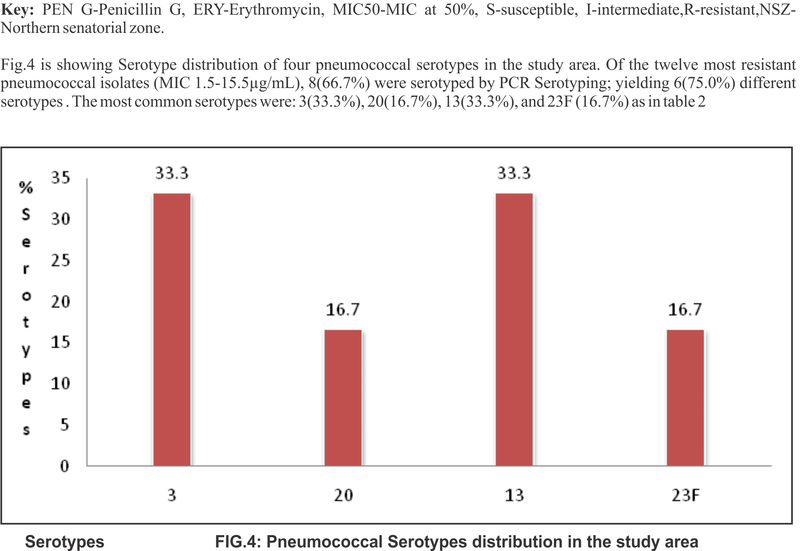 Higher prevalence of Streptococcus viridians Group (SVG) recorded in this study than Streptococcus pneumoniae implies that the diagnosis of pneumococci can be problematic and if not chanced occurrence; only the use of specific gene targets may solve the problem of inaccurate identification of pneumococci. Serotype 3 and 13 are the most prevalent serotypes causing disease in this study. Screening for pneumococcal vaccination status should be authorized in patients age 60yrs or older. Events that reduce selective pressures deriving antimicrobial resistance must be encouraged such as: More appropriate use of antimicrobials, Vaccination must be enforced (PCV and PPSV) . The authors sincerely thank Ahmadu Bello University Teaching Hospital, Zaria and all the staff of department of Medical Microbiology, ABUTH, Zaria for their support. 1. Abla Hecini-Hannachi, Chafia Bentchouola, Abdesslem Lezzar, Kaddour Belabed, Hocine Laouar and Farida Smati (2014). Serotypes and Antimicrobial resistance of invasive Streptococcus pneumoniae isolates from East Algeria (2005-2011). African journal of Microbiology Research;8(2):167-177.doi:10.5897/AJMR2013.5833. 2. Abubakar A A, Sambo M N, Idris S H, Sabitu K, Nguku P.(2013).Assessment of Integrated disease surveillance and response Strategy implementation in selected Local Government Areas of Kaduna state. Annals of Nigerian Medicine 7(1):14-19. 3. Akpede G O, Abiodun P O, Sykes R M.,(1994). Relative contribution of bacteremia andMalaria to acute fever without localizing signs of infection in under-five children; Journal TropicalPediatric: 38:295-98. 5. Bacteriology –test procedures (2014). UK standards for MicrobiologyInvestigations 2.2(2.3): 4-13.Standards @ phe.gov.uk.(2014). 6. Bandettini R. and Melioli G(2012). Laboratory diagnosis of Streptococcus pneumoniae infections ; Past and Future. Journal of Preventive Medicine and Hygiene 53:85-88. 7. Blaschke.J.Anne. (2016).Interpreting Assays for the Detection of Streptococcus pneumoniae./Clinical Infectious Diseases; 63(2):S331-S337. 8. Calix J J and Nahm M H. (2010).A new pneumococcal serotype 11E has a variable Inactivated wcjE gene. Journal of infectious disease.202:29-38. Centers for Disease control and prevention [CDC, (nd)].PCR deduction of Pneumococcal serotypes. https://www.cdc.gov. 9. David Farrell, Stephen Jenkins, Steven D.Brown,Manish Bruce S.Lavin, and Keith P.Klugman(2005) Emergence and Spread of Streptococcus pneumoniae with erm(B) and mef(A) resistance. Emerging infectious diseases; 11(6):851–858.doi: 10.3201/eid1106.050222. 10. Donkor ES, Newman MJ, Oliver-Commey J, Bannerman E, Dayie NTKD, Badoe EV(2010): Invasive disease and paediatric carriage of Streptococcus pneumoniae in Ghana; Scandinavian Journal of Infectious Diseases 2, 42:254-259. Predisposition to Invasive Disease and Carriage. PLoS ONE 8(1): e53925.doi:10.1371/ journal.pone.0053925. 13. Fukushima K.Y, Yanagihara Hirakata, Y.Sugahara K, Morinaga, Y, kohno S, Kamihira S(2008).Rapid identification of penicillin and macrolide resistance genes and simultaneous quantification of Strepto-coccus pneumoniae in purulent sputum samples by use of a novel real-time multiplex PCR assay clinical Microbiology.46 (7):2384-2388. 14. Habib AG, Nwokedi EE, Ihesiulor IU, Mohammed A, Habib ZG (2003). Widespread antibiotic resistance in savannah Nigeria. African Journal of Medical Science; 32:303–5. 15. Iliyasu Garba, Abdulrazaq G. Habib, Musa Mohammad Borodo, Musa Baba- Shani, Mohammad Ahmed (2014). Pneumococcal infection in Nigeria: Preparing for the vaccine. Sub-Saharan African Journal of Medicine; 1:15-19. 16. 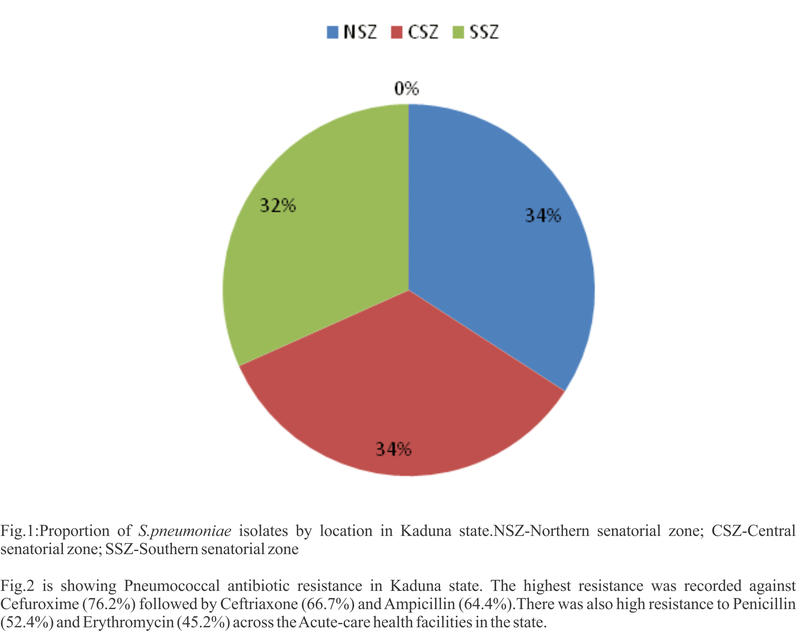 Iliyasu Garba, Abdulrazaq G.Habib and Aminu Mohammad (2015).Antimicrobial susceptibility pattern of invasive Pneumococcal isolates in North West Nigeria. Journal of Global infectious Diseases;7(2):70-74. 17. Iwalokun Bamidele A.,Fowora M.,Akinloye Olubukola,Oluwadun Afolabi,Antonio M. and Adegbola, R.A. (2012).A retrospective study of clinical Streptococcus pneumonie isolates from four health facilities in South-west Nigeria. International Journal of Medical Sciences.4 (8):160-67. 18. Jenkins SG,Brown SD, Farell DJ(2008).Trends in antibacterial resistance among Streptococcus pneumoniae isolated in the USA: Update from Prospective Resistant Organism Tracking for the Ketolide Telithromycin(PROTEKT) US years 1-4.Annals of Clinical Microbiology and Antimicrobials.7:1-11. 19. 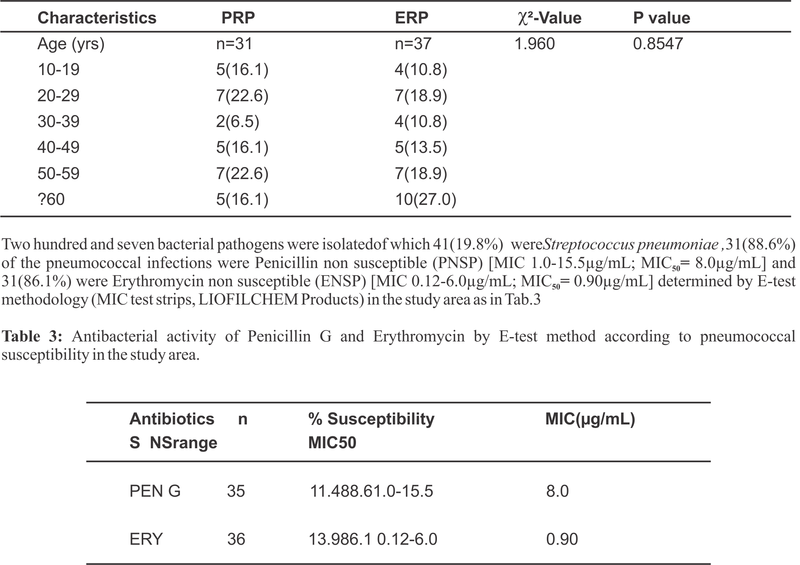 J?rg J, Ruhe, Leann Myers, David Mushatt and Rodrigo Hasbun(2016).High-level Penicillin-nonsusceptible Streptococcus pneumoniae Bacteremia: Identification of a low-risk subgroup. Clinical infectious Diseases 38(4);508-514. 20. Kandakai-Olukemi Y.T and Diso M S(2009). Antimicrobial resistant profile of Streptococcus pneumoniae isolated from the nasopharynx of secondary school students in Jos. Annals of African Medicine; 8:10–3. 21. Kuster SP, Rudnick W, Shigayeva A, et al.(2014). Previous antibiotic exposure and antimicrobial resistance in invasive pneumococcal disease: results from prospective surveillance. Clinical Infectious Diseases; 59:944. 23. Malley R, Henneke P, Morse SC, Cieslewicz MJ, Lipsitch M, Thompson CM, Kurt-Jones E, Paton JC, Wessels MR, Golenbock DT. (2003). Recognition of pneumolysin by Toll-like receptor 4 confers resistance to pneumococcal infection. Proceedings of the National Academy of Sciences (PNAS) 100: 1966–1971. 24. Marcus H.Leung, Kevin Bryson, Kathrine Freystatter,Bruno Pichon,Giles Edwards, Bambos M.Chara lambous,and Stephen H.Gillespie(2012). Sequetyping: Serotyping Streptococcus pneumoniae by single PCR Sequencing Strategy. Journal of Clinical Microbiology; 50(7):2419-2427. 25. Minimum Inhibitory Concentration(MIC) Guide,(2015). MIC Test Strip technical Sheet Streptococcus pneumoniae-MTS23 Rev.6/19.03.2015. 26. Mohammad Kargar, Maryam Baghernejad, Sadegh Ghorbani-Dalini, Akram Najafi (2012).Multi-drug resistance and molecular pattern of erythromycin and penicillin resistance genes in Streptococcus pneumoniae. African Journal of Biotechnology .11(4):968-973. 27. Mohammed Kadum Al Araji(2013).New technique use to rapid isolation pneumococcus bacteria fromboth pneumococcus meningitis and pneumococcus pneumonia infections in Iraq. Qatar Medical journal;9(16). 28. National Committee for Clinical Laboratory Standards (2002): Twelfth international supplement, M100-S12. Wayne, PA: NCCLS; 2002: Performance standards for antimicrobial susceptibility testing. Frimodt-Mølle and Hans-Christian Slotved.(2013). Penicillin resistance and serotype distribution of Streptococcus pneumoniae in Ghanaian children less than six years of age. BioMed Central Infectious Diseases, 13:490 doi: 10.1186/1471-2334-13-490. 30. Oduyebo OO, Nwaka DU, Nwaowolo C, Ogunsola FT (2006). Resistance patterns of Streptococcus pneumonia isolated from the upper respiratory track of persons attending various clinics of a University Teaching Hospital in Lagos, Nigeria. African Journal of Clinical and Experimental Microbiology; 7:89–97. 31. Schrang. J. Stephanie, Bernard Beall and Scott Dowell (2001). Resistant Pneumococcal infections; the burden of disease and challenges in monitoring and controlling antimicrobial resistance: A background document of the WHO Global Strategy for containment of Antimicrobial Resistance. 32. Tests online (2014).Peer reviewed patient centered Outcomes driven.labtestonline.org/understand ing/analytes/Sputum-culturing/tab/related; retrieved 28th April, 2015. 33. Wayne P.A (2006). Clinical and Laboratory Standards Institute: Performance standards for Antimicrobial susceptibility testing; 16th informational supplement, CLSI document M100- S16. 34. World Health Organization (2005).A Background Document for the WHO Global Strategy for Containment of Antimicrobial Resistance.file:///C:/ Users/u/Desktop/RESISTANT% 20PNEUMOCOCCAL %20INFECTIONS.pdf. 35. WHO,/CDC /USAID (2003).Manual for Laboratory Identification and Antimicrobial Susceptibility Testing of Bacterial Pathogens of Public Health Importance. WHO/CDS/RMD/2003.6.